Forgotten wireless password – how to connect? First off, if you are going away from home, take a small Ethernet cable for the worst case scenario. Grab the one that goes from your router to the cable box (cable systems only) or the one from your PC to the router if you have no spare. That way, you can plug the laptop into the router and it will definitely work, as this is the way they are all designed. For the wireless password, there is usually a sticker on the router itself. This will generally show the name of the wireless network (also known as “SSID”) and the password to get onto it (also known as “Passphrase” or “Key”). This would mean you only have to tell your PC to connect to their wireless network and then put in the password exactly as shown (it’s case sensitive) and you will be connected. The installer may have changed this to his own SSID and password. In this instance, if you have access to the router with the Ethernet cable, you can logon to it and change the settings to something else. The router address is the “Default Gateway“, eg 192.168.0.1 or similar. You may need to scroll back up on some systems to see this. When typed into the browser address bar at the top, this number communicates with the router directly. You will often see a password page at this point, so what happens when you don’t know or remember the password? Read on…. 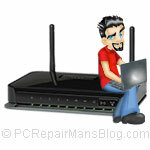 Usernames and passwords are often written on the router but you can try a few of these. I’ll write them in Username, Password format. There are many other variations but 80% are still unlocked like this. Once in, change the wirelessname and key to a more secure one (use WPA-PSK or WPA2 ideally) and make a note of it on the router. Change the default admin password on the router and write this on the router too. Plugging the cable into the router will do nothing except give your PC the internet connection (just like your one at home maybe). No settings will be altered and their wireless will still work at the same time as well. Antivirus programs can detect this as a Trojan so they may need to be told to ignore it as a threat. It’s not dangerous, but obviously they are protecting you from a wireless password hack!